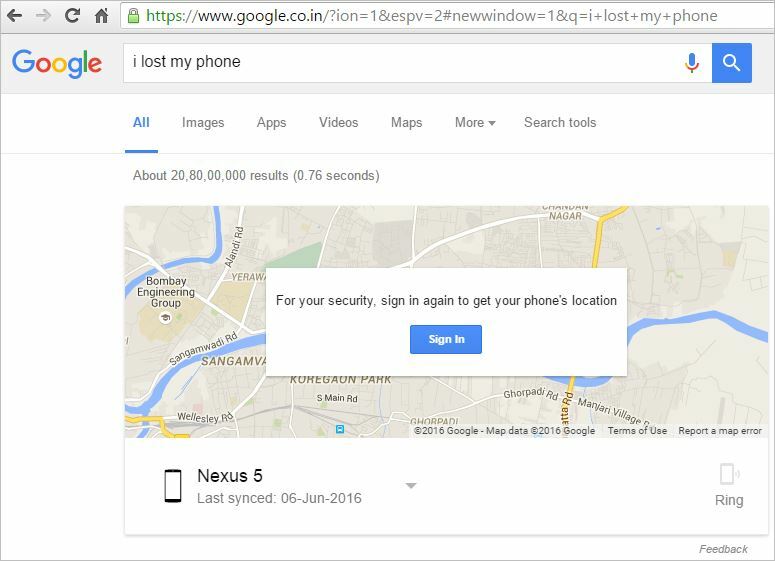 Track your Lost Phone, Simply Google – I lost my phone. Locating your android or an iOS phone has become very easy now-a-days. Just install any mobile tracking application or log into Google Device Manager Website or Google Maps to find your Android Phone. At this moment, phones have become a very important part of our life, and somehow if you lose it, everything stops, your SMS, chats, banking Apps, One Transaction Passwords, 2-Step authentication and lot more things. Thanks to the new update in Google Accounts, now locating your lost phone is a one string task. All you need to do is going to your web-browser on desktop, where you need to be signed with your Google Account (mostly your own personal computer). Go on Google Search homepage and type in ‘i lost my phone’ and hit enter. As soon as the command is entered in Search box, Google tries to connect with your phone, and in some cases, it might ask you to sign-in back with your Google Account as shown below. Within few seconds, the search results displays you the current location of your lost mobile. You can also change to any specific device, if you own multiple devices with same Google account. There are few prerequisites for this feature to work. Your phone should have active Google account signed-in for cloud syncing. The GPS on your phone needs to be active. You need to be signed-in into your web browser with your Google Account to get this feature working. Get the country restricted PokemonGo on your phone.